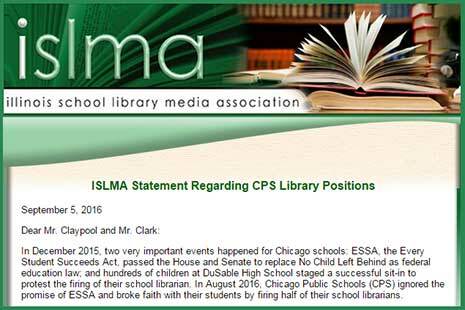 The Illinois School Library Media Association (ISLMA) sent a letter September 5 asking Chicago Public Schools (CPS) CEO Forrest Claypool and Chicago Board of Education President Frank Clark to reverse recent budget cuts and return librarians to the city’s school libraries. ISLMA’s letter urges administrators to use Every Student Succeeds Act (ESSA) funding to reinvest in in school librarians. ESSA authorizes states to use federal money for effective school library programs. Fleser says they have received no response yet from CPS. 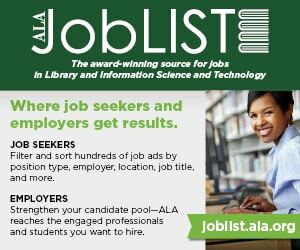 The number of certified librarians at CPS has dropped from 454 in 2013 to 217 in 2016; the 2017 budget includes funding for just 157 librarians. 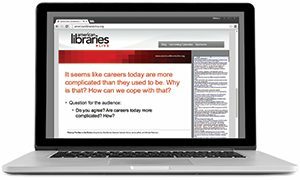 In recent years, ISLMA has sent previous statements in support of librarians in West Aurora and at Chicago’s DuSable High School. DuSable’s librarian, Sara Sayigh, was reinstated after a student sit-in protest went viral. ISLMA has also been working with the Illinois State Board of Education (ISBE) to ensure ESSA funding makes it to other state districts for effective school library programs. ISBE is doing a listening tour in September and October for education stakeholders to provide public comment on how it implements ESSA. Fleser says librarians have been attending these meetings to stress the importance of school librarians and school library programs. 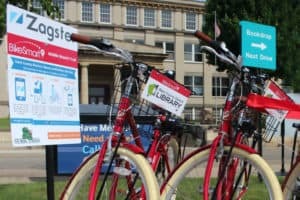 Fleser encourages parents and students to talk to school administrators and tell them how important librarians are for academic achievement, reading, and overall readiness for education and for the world. AMY CARLTON is senior editor at American Libraries.